Emma Lazarus: �Jews need a territory�. 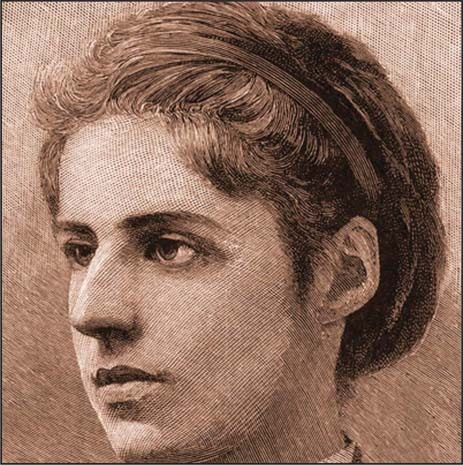 The legendary writer-poet, Emma Lazarus (1849-1887) was ignored, for many years, by this country. She was excluded from the American national pantheon. The Statue of Liberty does not have a soul without Lazarus' unique, legendary sonata, The New Colossus. Lazarus, who died at the age of 38, wrote this great sonata in 1883. Thanks to her friend, Georgia Schuyler, this sonata was inscribed, in 1903, on a bronze tablet inside the pedestal of the Statue of Liberty. Lazarus called her the 'lady with the torch'. The mother of exiles. This sonata expresses, and symbolizes, the essence of the spirit of America: a frontier of salvation, of freedom of the masses of newcomers, immigrants, homeless, poor victims of persecutions and hate who are yearning to breathe free. Lazarus, a Sephardic-Jewish poet-writer of many essays, is still waiting for national recognition. Recently, the Museum of Jewish Heritage, a living memorial to the Holocaust (36 Battery Place, tel: 646-437-4200), celebrated the 125th anniversary of the Statue of Liberty with a special exhibition through the summer of 2012. It is very educational inasmuch as it enriches all visitors with the story of Emma Lazarus. The sonata is a song to the light, which eliminates the darkness. This light, this lamp, shows the newcomers the golden door of America to the new world! Lazarus was like a prophet who figured out the future of America is based on democracy, liberalism, and the melting pot concept. She was praised by many famous writers of her generation. One of them wrote that he admired the New Colossus more than the statue itself. What is the linkage between the New Colossus and Lazarus' Judaism? What are the roots of this contribution to American history? First, Lazarus wrote many poems and articles all rooted in Jewish culture and history both ancient and modern. By the way, there were stories that she converted to Christianity because her sisters tried to ignore their Jewish background. Lazarus was, first of all, a Jew. Second, the New Colossus is a national Jewish sonata. Why? Lazarus was influenced then by the terrible Russian Czarist genocide of Jews in Russia and East-Europe. The 1880's were the era of the pogroms: 'Kill the Jews in order to save Russia.' The 'golden door's' target was to save these Jews, these refugees. Lazarus understood that the Jews were the exiles of Europe. They were the first people to be persecuted and massacred, always victims of gentile violence. She, also, wrote the poem 1492 to express the terrible brutal exploitation and destruction of the Jews in Spain. She wrote many poems such as A Jewish Miracle, Bar-Kohva, The Prophet (Maimondis Rambam, wrote about the Eternal Lamp). She also published many articles such as A Letter to the Hebrews. She managed a personal struggle against anti-Semitism. Second, her sonata expressed a new world, a world without hate, a world of democracy, humanism and progress. What is the linkage between the New World and the Jews? Lazarus argued that Jews are the national pioneers of progress (even socialism), humanism and liberalism. The Jews support the revolutions. They are willing to protest against evil. They love freedom. They are suffering because they are dedicated to the truth. Lazarus declared: "If all of us would not be free, no one else would be free." The root of this new word in the Mosaic belief, values, morals, is in the Old Testament and not in the new one! Judaism and progress in the New World are synonyms. Third, Lazarus was also a Zionist who struggled for a Jewish state in Palestine. She asked the U.S.A. to help Zionists by pressing the Ottoman Empire, which then controlled Palestine. She argued that Jews need a territory so they would be able to settle over there. It was her solution to the pogroms in Russia, a salvation for victims and for refugees. She pushed American Jews to help the Zionists. There was not a contradiction between Zionism and American patriotism! (She saw our future: Jews support Israel as an act of Jewish-American loyalty!) Furthermore, Lazarus argued that Jews would be equal to gentiles only if they would establish a Jewish free state.